Are you guys tired of my Instant Pot recipes already? I’ve really been having a blast. I think I’ve pretty much figured out the pressure cooking of hearty meat dishes now and these meals are really great for Sunday nights when my kids are usually not keen on going out at night as they are usually rushing last minute homework assignments. This is completely different from my childhood where Sundays were marked by church in the morning, an afternoon nap, swimming and finally dinner out with the family. These dinners are still seared on my memory – dinner at the Singapore Medical Alumni clubhouse, Manhill restaurant or some other Chinese restaurant. Neither of my parents were foodies, and it always puzzled me why I grew up so food obsessed. We never ate at very expensive places, but we did have good exposure to genuine and good quality local food, and I probably have those dinners to thank for the development of my palate. Anyway this weekend, dinner definitely had to be at home as kid#1 has his ‘A’ level exams next week and kid#2 has her ‘O’ level Chinese exam to take. Kid#1 specifically requested more low carb meals this season as carbs make him feel sleepy. I’m not complaining because that is entirely up my alley. I was always a little concerned about how I would get the lamb shanks into the pot, given that I have a 6 quart and not an 8 quart pot. But it worked well anyway although one piece was not fully submerged, the meat was still tender, succulent and fall-off-the-bone. 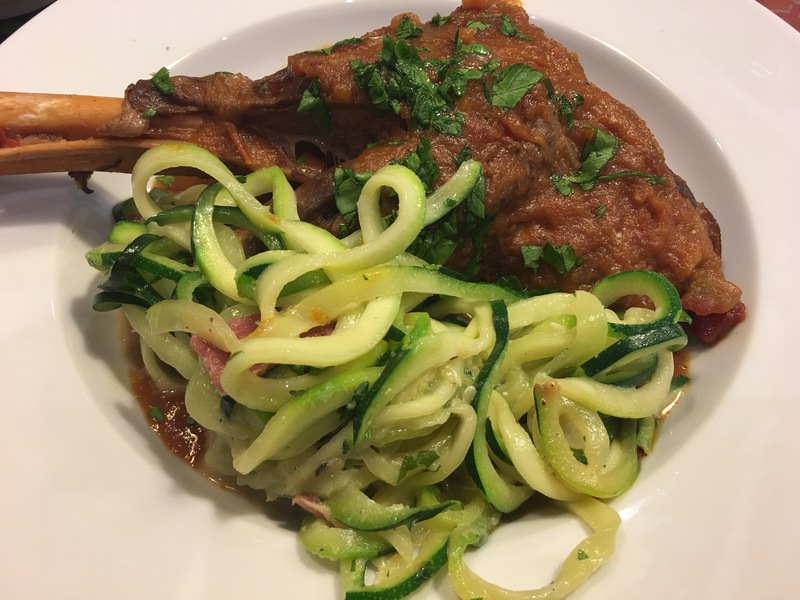 There was somehow a mellow and sweet flavour to this lamb dish and yes, this recipe is a keeper! Definitely a weekend well spent. Turn on the sauté function for the Instant Pot and heat up the olive oil. Sear the lamb shanks, 2 at a time in the pot till browned on all sides. Set aside. Sauté the garlic, onions and carrots till lightly caramelized. Add the balsamic vinegar and continue to sauté till the vinegar has evaporated. Add the wine and continue stirring the vegetables in the wine till slightly reduced. Add the broth, diced tomatoes in their juice as well as the fish sauce. Add the dried thyme and bay leaves, ensuring they are immersed. Lay the lamb shanks in the pot, immersing the meat as much as possible. Close the lid of the pot and put the valve into sealed position. Use the manual function to high pressure for 45 minutes. Allow normal pressure release when done. Remove the lamb shanks and set aside, preferably in a warm place. Remove the bay leaves. Skim off the oil from the gravy. Put the pot back on sauté mode and reduce the sauce further, about 15 minutes. Use a hand blender to purée the gravy. Plate the lamb shanks on shallow plates. Ladle the gravy over the lamb shanks. Sprinkle the parsley over the lamb. Serve hot. (I served with a side of zucchini noodles). may i know what’s an Instant Pot? 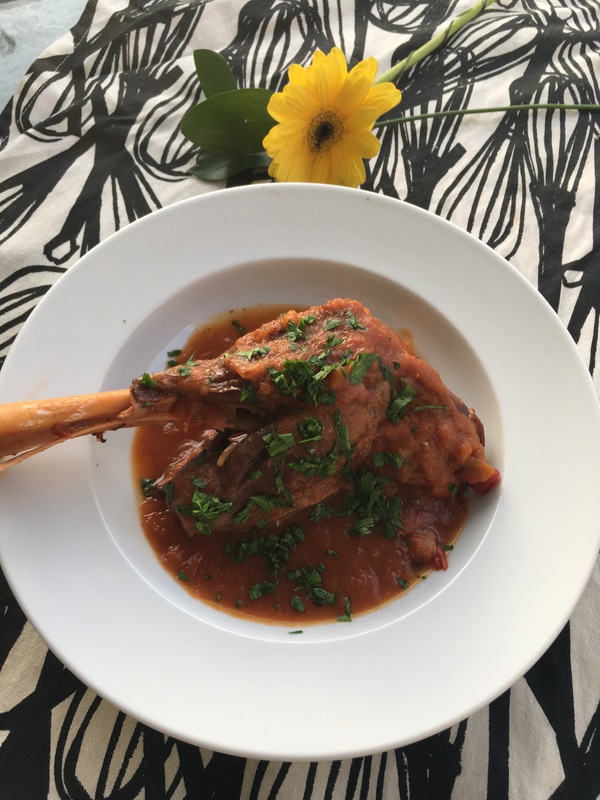 I used a very large lamb shank and had to cook 15 mins longer.. I think it depends on the cut. In general if the meat is a little bulkier about 10-15 min more to make it fall off the bone would be better. Made this tonight for my daughter’s 10th birthday. She wanted lamb. I was hesitant as I have never made lamb. It turned out moist, tender and flavorful. Fall off the bone tender. I have only had the instant pot for about 1 1/2 weeks and so far it hasnt disappointed me. Wondering how long if lamb shanks are frozen. Actually the IP can do it from frozen. Maybe 5 min more? Hi -I am going to use this recipe this evening in my new Instant Pot. As I am at the cottage I am using what I have on hand. I have strained tomatoes instead of diced – what size can was the one you used? Thank you. The 14 oz (411g) can. Have a great cook! perfect thank you! Ill let you know how it goes! This recipe is exceptional exactly as written. My picky husband said it was “restaurant quality,” and everyone else also raved about it. It took 2 hours start to finish due to the browning step at the beginning and gravy reducing step at the end, but both steps build delicious flavor. Thanks for the recipe! How big of a can of diced tomatoes should I use. A 14 oz can should be fine. Love the flavors, but the recipe calls for salt and it’s not mentioned in the instructions. Also, it’s customary to list the ingredients in the order they’re used, which makes it easier to follow. Thanks for the feedback terry. The broth is already salted (catering for most readers who buy stock and don’t make their own broth). The ingredients are put in order of solid ingredients, followed by liquid ingredients and then by seasoning.